M.D Forte Facial Cleanser is suitable for any skin type, although people with dry, normal, combination and slightly oily skin usually find it more effective. There are a couple of users with sensitive skin that have used this and they found it a little irritating for their skin. 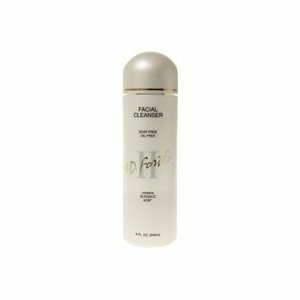 This daily use cleanser should remove makeup and dead skin cells easily as it has a higher amount of Glycolic compound. This compound is a pH balanced mixture of glycolic acid, ammonium glycolate, purified water, and higher-molecular-weight oligomers of glycolic acid. The cleanser should leave skin cleaned deep down into pores and feeling smooth and soft. I personally would not recommend this cleanser to those of you that have very sensitive skin. It has had an irritating effect on other users with sensitive skin and the acids in the ingredients can be a little harsh. Jamie Kelly said on Amazon that M.D Forte Facial Cleanser helped to clear her acne. Other users found it worked great for smoothing dry skin and removing makeup. One lady said it even made her look ten years younger. However a few patrons found it didn't remove their makeup effectively, so they had to buy a separate makeup remover. Purified Water (Aqua), Glycolic (and) Ammonium Glycolate, Cetyl Alcohol, Stearyl Alcohol, Sorbitol, Ammonium Lauryl Sulfate, Methylparaben, Propylparaben. Use a quarter-size amount and massage over wet skin. Rinse thoroughly with warm water. Pat dry. Use either morning or night. On the whole M.D Forte's cleanser seems to work quite well. Most users said it removed their makeup and smoothed their skin. A few ladies did find it a little irritating for their sensitive skin. Just check the ingredients before you give it a try to make sure your skin can tolerate them. This is a little pricey for $28 but none of the users seemed to mind and some said it got rid of their acne so its worth it. You are currently browsing the archives for the M.D Forte category.